*Say goodbye to expensive batteries! Simultaneously charge two Wii Remotes with the funniest, zaniest charger available today. Simply remove the battery covers and batteries from your Wii Remotes and affix the rechargeable NiMH battery packs in their place to prepare yourself for hours of continuous gameplay. 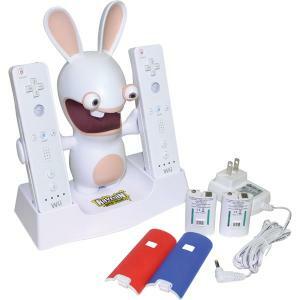 The Rabbid’s eyes are the charge status indicators, further adding to the excitement of owning the very same charger Rayman would be proud to call his own.